"Rita helped me identify areas of improvement and gave me guidance on how to develop resilience within my own life." Thinking about working with a life coach? The time to start is now . . .
As a resilience strategist and coach, I provide new perspectives and recommend strategies for people looking to make changes in their personal or professional life. Strategic personal coaching is customized specifically to your most important goals, interests, challenges, and needs. The goal of private sessions is to offer insight and assistance that will guide you towards actionable, positive changes that will affect all areas of your life. Throughout the process we explore the long-standing attitudes and habits that have influenced your life. Armed with this insight, you will develop a workable plan to manage the challenges that come your way. As we uncover your resilient skills and attitudes, the building blocks to strengthening and maintaining your resiliency, we will work to reinforce the resilience skills and attitudes you do have, and develop the ones needed to help you achieve your goals, and meet the challenges you may encounter along the way. 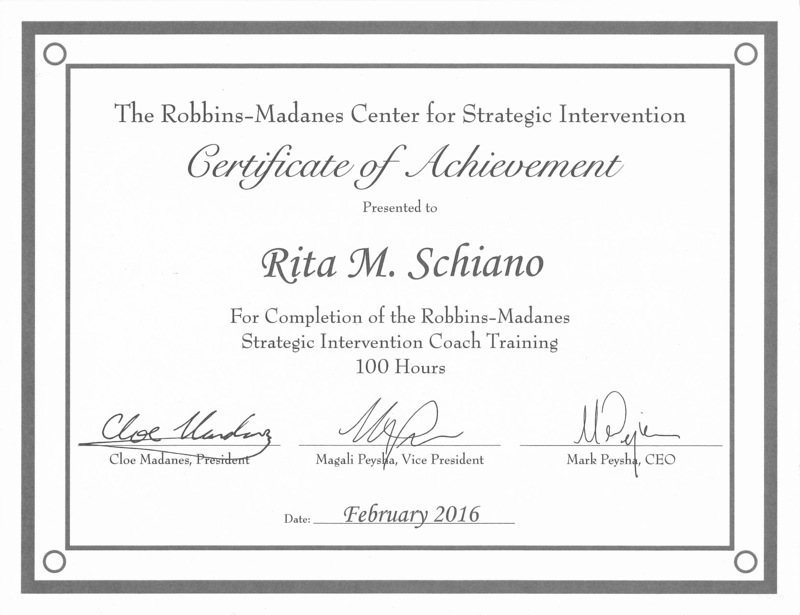 Rita received her S trategic Intervention Coaching Certificate from Robbins-Madanes. Strategic Intervention Coaching (also known as SI) practices extracts the most practical and effective forms of strategic action and communication from a variety of disciplines: Ericksonian therapy, strategic family therapy, Human Needs Psychology, organizational psychology, neurolinguistics, psychology of influence, strategic studies, traditions of diplomacy and negotiation. 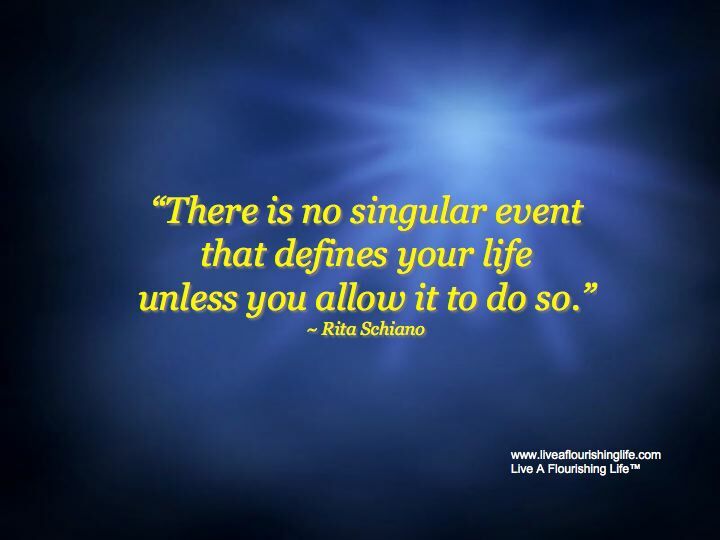 "Rita taught me to awaken positive traits I see in myself or have exhibited in the past. This insight will help me manage current and future stressors." Strategic Personal Coaching is a process and the duration of the coaching relationship varies depending on one's personal preferences and needs. Private office in Sturbridge, MA, or by phone, Skype, Facetime, or Doxy.me. For more information CONTACT RITA directly. Wondering if strategic coaching is right for you? Call or CONTACT ME to arrange a consultation! Maintenance Coaching is an on-going support program for those who have worked with me in private sessions or workshops and want to continue their personal progress in creating positive change in their life. We meet in-person or via phone or Skype, Facetime, or Doxy.me for two (2) sessions per month for three (3) to six (6) months. The Maintenance Coaching Program is $175 per month (paid on the 1st of each month’s scheduled sessions). Register here to set up your Maintenance Coaching Program. Upon receipt, we will contact you via e-mail and/or telephone to set up a schedule. Session options are in-person at the Sturbridge office or online via Doxy.me. It's exactly that … If you have a pressing matter, needs insight and direction on a specific issue, or need support in resolving a specific situation or concern, the Single Tune-Up Session is for you. To set up your Single Tune-Up Session please call 774-230-5670 or e-mail me.